Braixen in game: 335 Who? Important notice! Pokemon Braixen is a fictional character of humans. 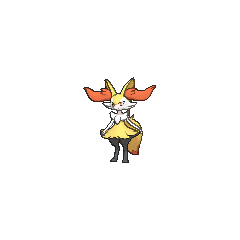 Braixen (Japanese: ?—? ?— Tairenar) is a Fire-type Pokémon introduced in Generation VI. 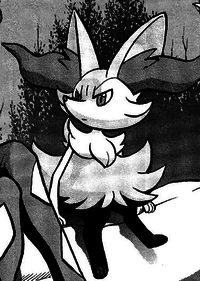 It evolves from Fennekin starting at level 16 and evolves into Delphox starting at level 36. 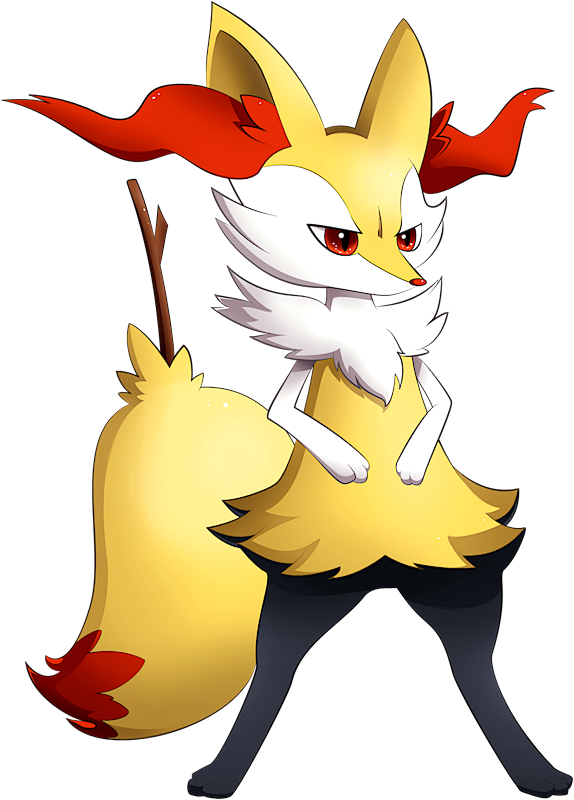 Braixen is a bipedal, fox-like Pokémon. While the majority of its fur is yellow, it has black legs, white arms, face and neck, and a dark orange tail tip. The fur on its cheeks is longer, and a small mane of white fur covers its shoulders and chest. Long, wavy tufts of dark orange fur grow out of its large ears, and its eyes and small nose match this fur in color. Above its legs, the fur sweeps out to either side. When its mouth is open, two pointed teeth can be seen on its upper jaw. 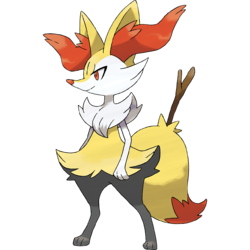 Braixen always keeps a stick in its tail, which it sets alight using its bushy tail fur. The flame from the lit twig is used for both attack and communication. Braixen made its debut in Day Three Blockbusters!, under the ownership of Aria. 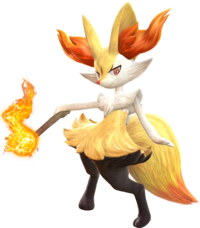 It was revealed to have evolved from Fennekin and later became a Delphox. Serena's Fennekin evolved into Braixen in Battling with Elegance and a Big Smile! during a double battle with Pancham against Aria's Delphox and Aromatisse. A silhouette of a Braixen appeared in A Frolicking Find in the Flowers!. XY047 Braixen Ash's Pokédex Braixen, the Fox Pokémon and the evolved form of Fennekin. To defeat its opponent, Braixen combines the flame from the twig in its tail with its fiery breath, composing a massive Fire Spin. XY064 Braixen Serena's Pokédex Braixen, the Fox Pokémon and the evolved form of Fennekin. Braixen uses friction to ignite the twig from its tail before a battle. Braixen appeared in Hoopa and the Clash of Ages under the ownership of Serena. After Trevor lost the Fennekin he was given from Professor Sycamore, it was taken by Malva after finding its Poké Ball put into box filled with other Pokémon gathered from Vaniville Town. After some time, it evolved into a Braixen. Some time after its stay at the Pokémon Village it evolved into a Delphox. Braixen appears as a playable character in the Wii U version. 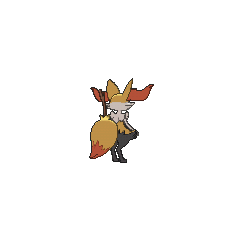 Braixen strikes at foes from a distance with fiery distance attacks, and also uses its stick to deal melee attacks. Some of its melee attacks are directly taken from Amy Sorel's moveset from the Soul Calibur series. It has a twig stuck in its tail. With friction from its tail fur, it sets the twig on fire and launches into battle. When the twig is plucked from its tail, friction sets the twig alight. The flame is used to send signals to its allies. Moves marked with a superscript game abbreviation can only be bred onto Braixen in that game. Occasionally erases two of the foe's disruptions on the board. 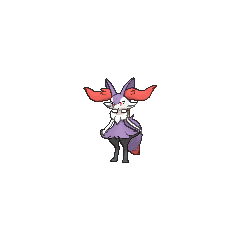 For other sprites and images, please see Braixen images on the Bulbagarden Archives. Braixen is the only Pokémon with a base stat total of 409. Braixen and its evolutionary relatives share their category with Vulpix and Ninetales. They are all known as the Fox Pokémon. Braixen is based on a fennec fox. It also has some witch-like traits, such as the use of its stick as a wand and broomstick-like tail. Braixen may be a combination of braise (French for hot charcoal) and vixen (female fox). It may also be an allusion to bruxa (Portuguese for witch). Tairenar may be a combination of ?—? tail and ??—? renard (French for fox).